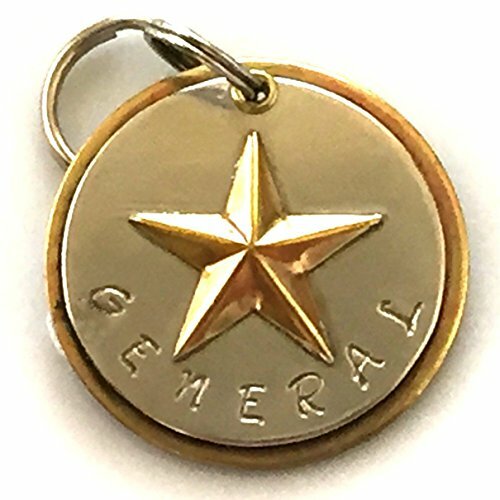 Your furkid will love this whimsical tag sporting a Raised Brass Star. We will stamp the name on the front and one phone number on the back, along with a paw, a bone designs or for the felines a fish, just let us know what you would like! This tag has been polished but is also available finished with an aged patina. When you purchase a tag from Claude's Paws, we hope you'll love our work. Your satisfaction is our goal. Please keep in mind that each tag is hand made. We will make every effort to reproduce the tag shown but there may be slight variations. Names and phone numbers are hand stamped one digit at a time and cannot be corrected, so double check your information when placing your order. If we get it wrong we will gladly make you a new tag. If you have any questions about this product by Claude's Paws, contact us by completing and submitting the form below. If you are looking for a specif part number, please include it with your message.